The ASPCA Animal Poison Control Center (APCC) is a 24-hour phone service if your pet has ingested a potential toxin. We do recommend this service, whether you at home, or in our clinic. There is a $65 consultation fee for any caller. For some advanced medical cases, a consult or referral to a board-certified veterinary specialist may be the best health decision for your dog or cat. 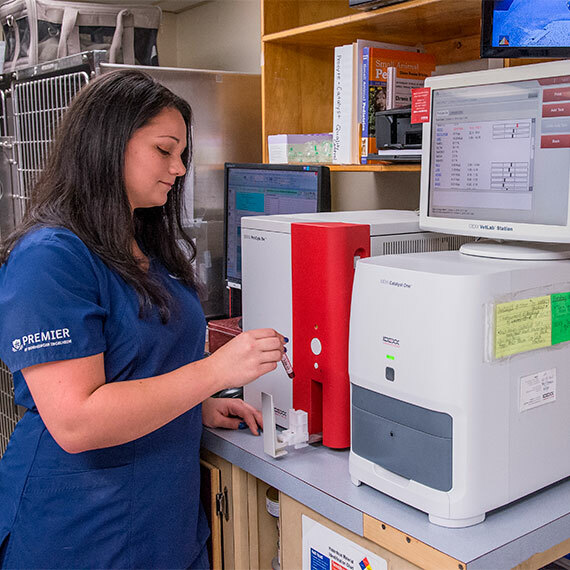 We work closely with some of the top veterinarians in all fields to bring the best medicine possible. Please visit our specialist referral page for recommendations. Jessy loading Catalyst One blood analyzer.